Pyongyang is the capital of the Democratic People's Republic of Korea (DPRK) and has a population of over 2.5 million. The North Korean government has worked very hard on making the city a "model city" and a showcase of Korean socialism and national strength. 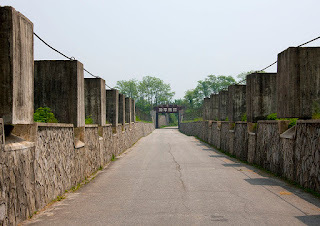 During the Korean War Pyongyang (which was just another large city at the time) was completely devastated, as was most of the Korean Peninsula. After the war Kim Il-sung, the founder of the DPRK, began working earnestly (with Soviet help) to rebuild the country and Pyongyang was officially declared the capital in 1972. Part of the rebuilding effort included city defense. Pyongyang is very possibly the most well defended city on Earth in terms of the number of defensive positions with hundreds of anti-aircraft locations, hardened artillery sites, multiple air bases and countless army units surrounding the city. Since Pyongyang is the social, economic, political and military heart of the country the city is home to the nation's elite and only citizens with special government permission are allowed to live there. In order to protect the elite from potential air raids the government has built a massive system of underground bunkers, hardened facilities and secret underground train lines which can extend over 300 feet below ground. The ground beneath the city actually belongs to the government solely for wartime purposes. Many of these bunkers are easy to spot from satellite images. Most of the bunkers can be found near apartment blocks and are rounded structures 50-90 feet in diameter. Others are large rectangular structures that seem to be reserved solely for the ruling class as they can be seen in and around the high-end districts and government buildings. Here is a map of the bunkers I have found so far. I am confident that I have located 90% of the bunkers that are visible from the surface. This map shows over 240 markers which corresponds to around 260 individual bunkers (most bunkers are solitary, but some exist in groups which will have a single marker for the group). This is a close-up of 2 smaller bunkers that are near common residential areas. You'll notice the wall around them and that each one has an associated entrance/maintenance building. The small white dots are ventilation shafts. Here are some of the largest bunkers I've found. Each are more than 120 feet long. This image shows 4 nearly square bunkers with multiple ventilation shafts and each has an associated structure on top. To the left there are actually two smaller rectangular bunkers as well. These are located near an elite residential and government area. The larger bunkers throughout the city also tend to have additional support buildings, guarded gates, military positions etc. All of the apartment buildings have basements which can act as evacuation areas as well. Even though the city has hundreds of bunkers, basement facilities and a deep subway system I doubt that they would provide sufficient safety for all of Pyongyang's residents. Also, given the poor quality construction materials used in domestic construction - nationwide - I would doubt their structural stability should they be attacked. However, the elite facilities are most likely built to far higher standards.